LOGAN, UTAH — Campbell Scientific, a maker of research-grade measurement instruments for over 40 years, is releasing a powerful new data-acquisition product: the CR1000X measurement and control datalogger. The CR1000X is our flagship datalogger, and provides measurement and control for a wide variety of applications. Its reliability and ruggedness make it an excellent choice for remote environmental applications, including weather stations, Mesonet systems, wind profiling, air-quality monitoring, hydrological systems, water-quality monitoring, and hydrometeorological stations. 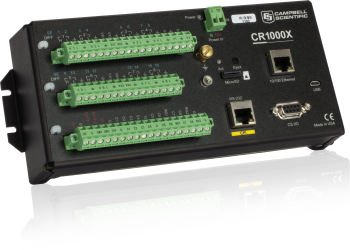 The CR1000X grew from the popular CR1000 datalogger, which is at the heart of nearly one hundred thousand measurement and control systems across the globe. The CR1000X has a much faster processor, with more channels and better accuracy and resolution. It has more ways to move your data, via added port options plus more built-in communication and storage features. This new datalogger operates in extreme environments, with a standard operating range of -40° to +70°C and an available extended operating range of -55° to +85°C. It captures quickly changing data values with faster analog measurement capabilities. It differentiates even slight changes in data values by way of its higher-resolution measurements. The CR1000X provides an embedded, browser-based user interface for quick and easy data and system interrogation from any IP device. This includes connections directly with USB or Ethernet, and wireless devices such as Wi-Fi, cell, or satellite devices. Memory includes internal 4 MB SRAM for data storage and a microSD drive for extended data storage up to 8 GB. For communication, the CR1000X supports full PakBus, Modbus, DNP3, and other protocols, making it an important part of your network. Campbell Scientific’s history of developing innovative products began in the 1970s, as one of the first to offer low-power, high-precision dataloggers for use in the field. The company has developed increasingly powerful dataloggers to satisfy customers’ measurement needs. To date, Campbell Scientific has manufactured more than 300,000 dataloggers.